so here we are today in the kitchen. Hangout of several dozen snowmen and the odd moose. So I guess the tree is as good a place to start as any. I’m assuming that you’ve already seen the very personal tree in my bedroom, and the large elegant one in the big room. 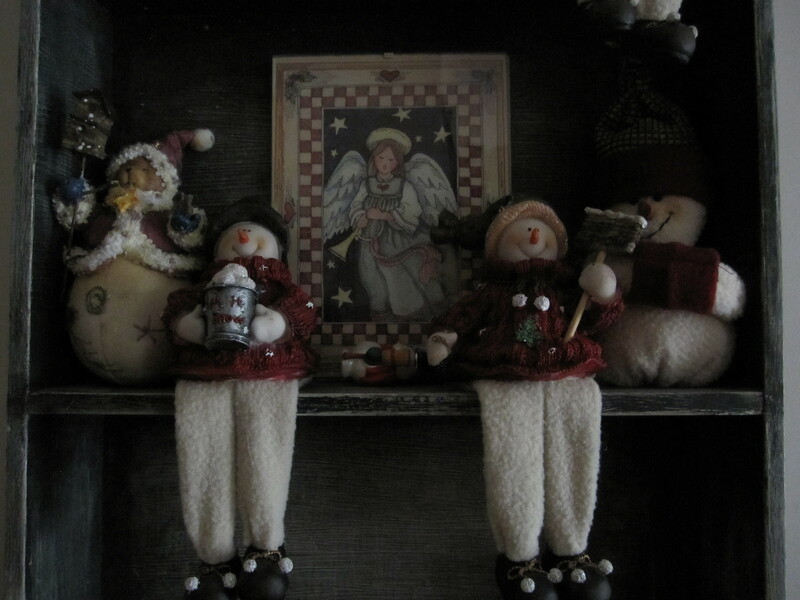 The one in here is only about 3 foot tall and is decorated with an assortment of tiny wooden German/scandinavian style ornaments, mostly angels, bells,and santas. There’s a collection of miniature antique-finish kitchen paraphenalia: a sugar sifter, egg whish, cookie cutters and so on, and this year, the collection of cinnamon cookie-dough ornaments that David helped me make a few weeks back. There’s enough spice in the recipe that the faint scent of cinnamon has permeated the whole kitchen. Just wonderful. there are candy canes for visitors, snowmen and only the sharpest of eye ever notices that the angel on top is actually a cat. the ones in stripy hats I found at a discount shop many years ago, for something like $2.50 each, so I bought … ahh … let’s just say ‘lots’ shall we and leave it at that. 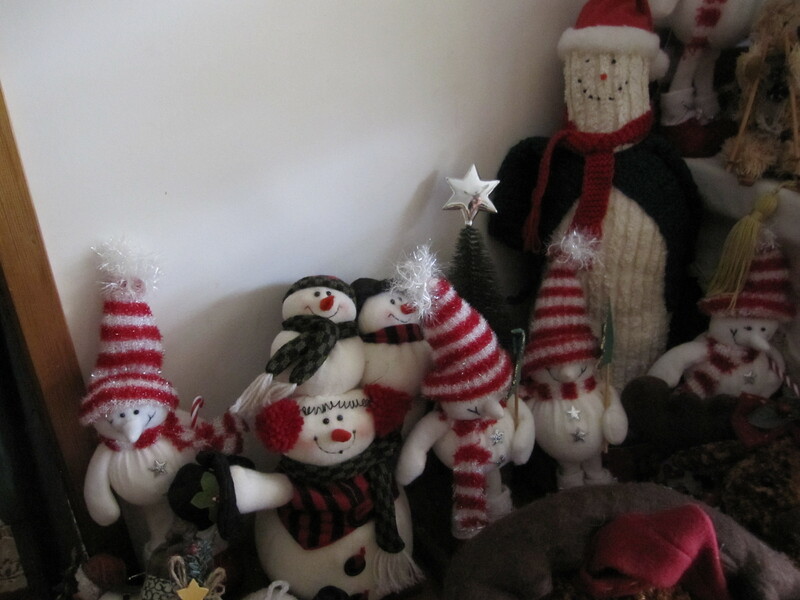 The two in front at left, I knitted from Alan Dart’s wonderful ‘Snome’ pattern. Somewhere there’s a third one in pieces that will get sewn up one day. 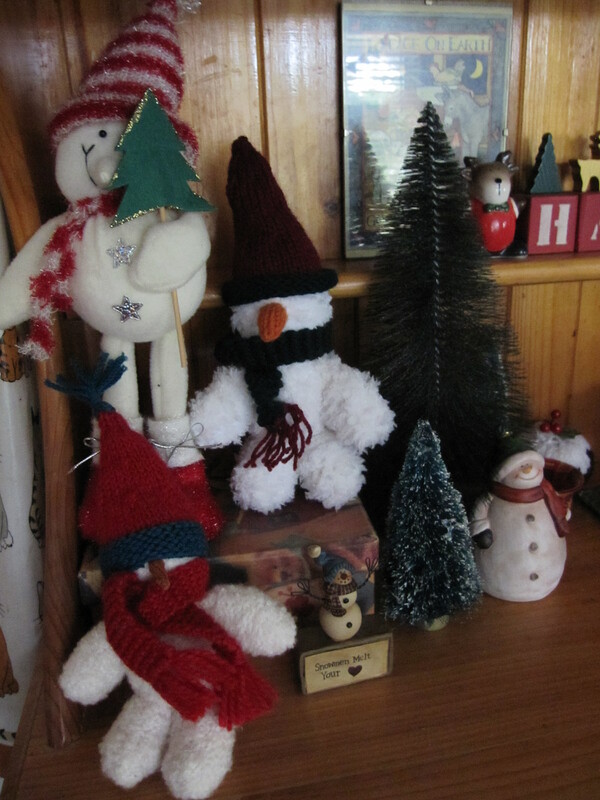 the sleepy child and the two pixies, currently sitting on ‘Happy Christmas’ blocks painted by friend Maz, have been around about as long as I have, while the wee gnome in the pointy hat is a more recent purchase. a birthday pressie from my friend Karen, who knows that I have no problem at all with getting Christmas things for my natal day. Her hat is a red and white mushroom – or would that be toadstool? 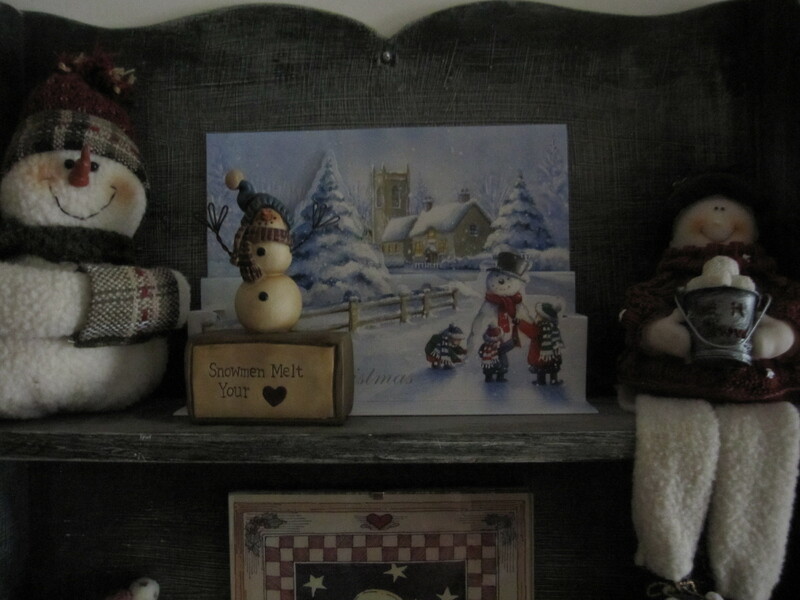 is the very first Christmas card I ever received. I was probably only a few days old, and it is signed from my mother’s godson, Alan John, then the ripe old age of eighteen months. Just between you and me, I suspect the hand of my lovely Godmother Gwen. Mum used to tape it up every year [ that’s the brown marks at the top ] and when years of this treatment took their toll, I had it laminated. I apologise to any collectors of ephemera currently having the vapours over my phillistine ways, but it was that, or stop using and enjoying it. Granted I have several other copies of the Night Before Christmas, but this is the one I used to read to the kids on Christmas Eve. 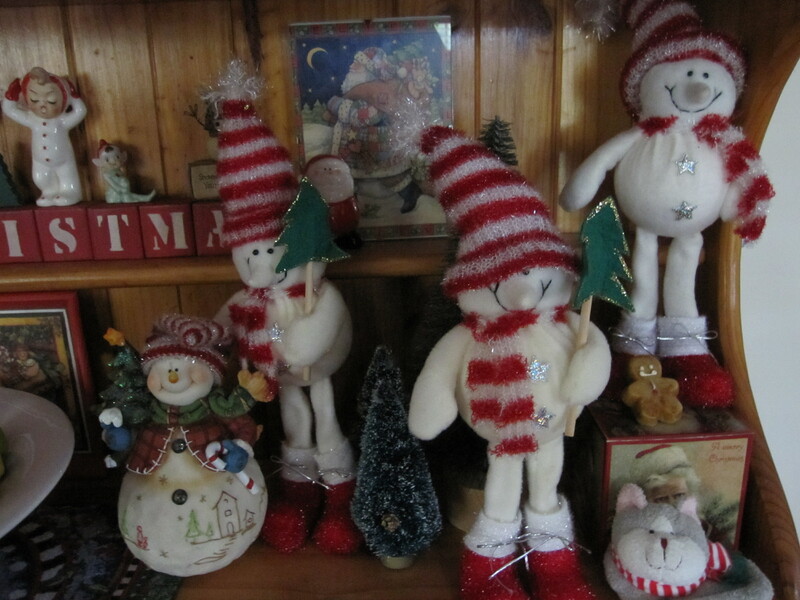 For many years I tended to steer away from any Christmas patterns or merchandise that featured snowflakes or snowmen … after all December here in the antipodes is the height of Summer. Shorts, sunscreen and mosquito repellant is more our style. But then,a few years ago, I decided that the only way I was ever likely to experience a white Christmas would be if I made it myself. 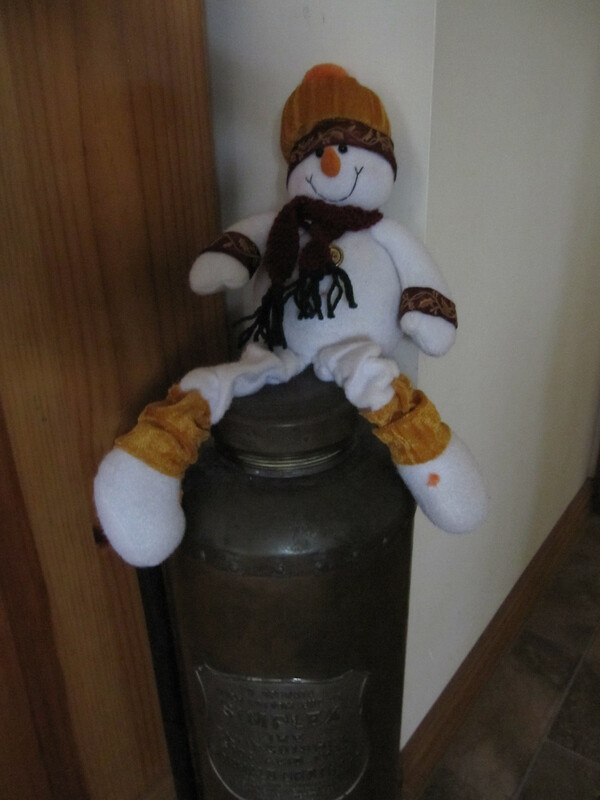 So, herewith, I give you the first installment of Christmas in my kitchen.